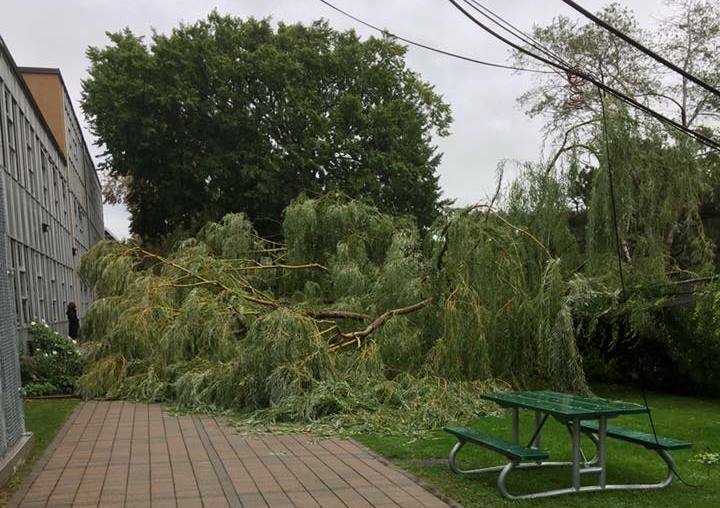 If you go by the Ashbridge Estate on Queen Street East, and you see a large willow tree, you might wonder: didn’t I hear that the big willow tree fell down? Yes it did, on September 29, 2016 in high winds. 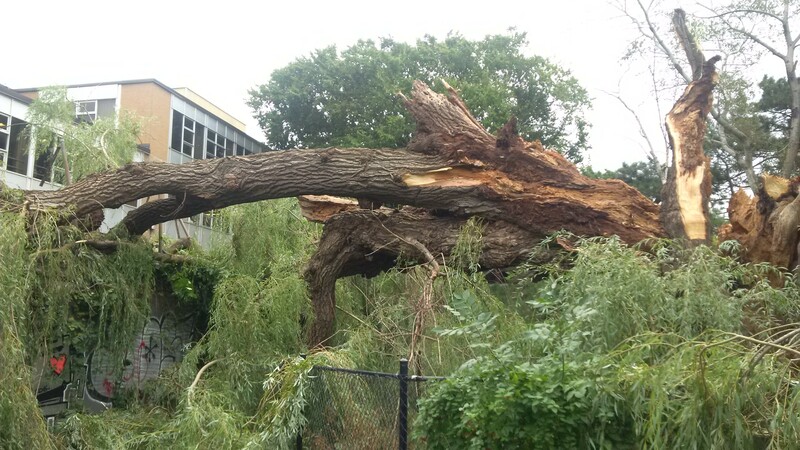 For years, its trunk was showing signs of severe rot, so its fall was a matter of time. 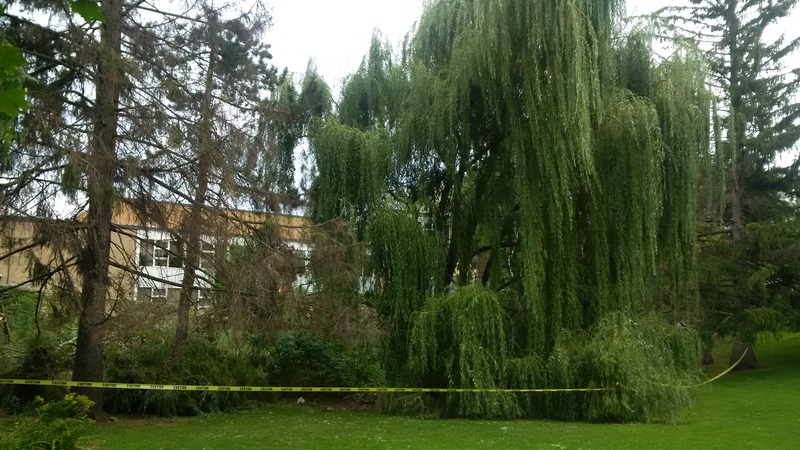 It lived for 97 years, about 20 more than the average lifespan for a weeping willow. At least that’s what a forester friend told me. What about the tree you see now, in the photo below? It’s the baby of the old tree, but the baby is more like a teenager now, already taking its place on the estate, growing in the moist earth above the Ashbridge’s Creek, now buried under its roots. 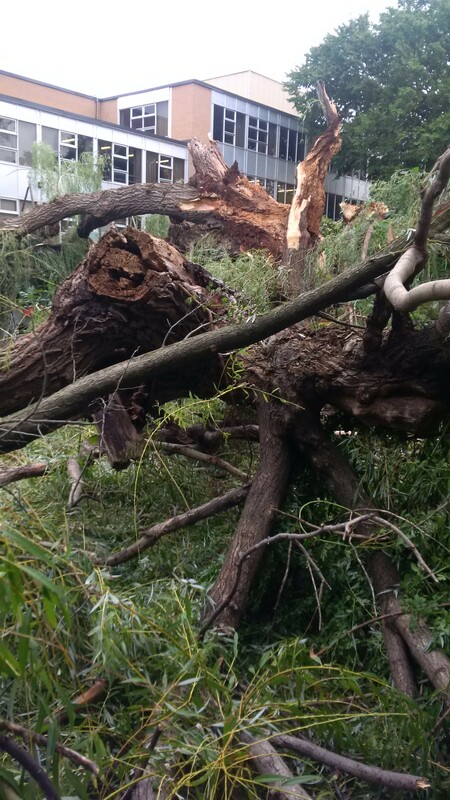 Scroll down to see a couple of photos of the old tree, taken today September 30, 2016. “Baby” willow, now a teenager, growing strong in front of the empty space left behind by its now-deceased parent. Ashbridge Estate willow, planted 1919, down September 2016. 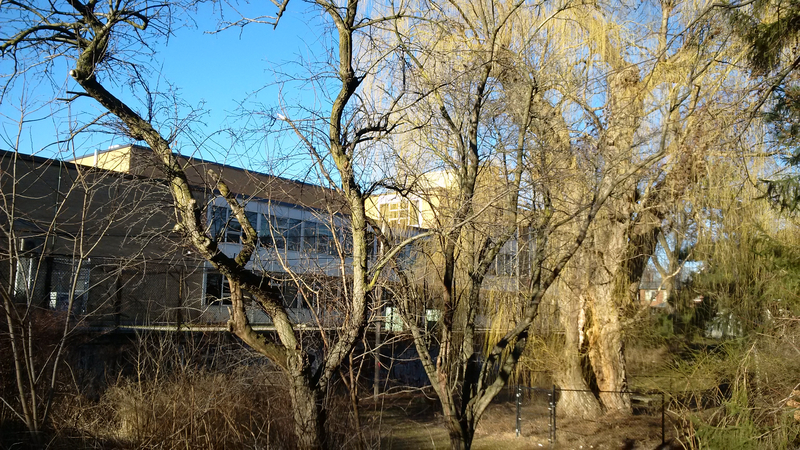 In March 2016 the giant willow, right, was showing deterioration in its trunk. Looking north to Duke of Connaught School from the back yard of the Ashbridge Estate. This entry was posted in Ashbridge Estate, Ashbridge neighbourhood history, Duke of Connaught Public School, Queen Street on September 30, 2016 by The Ashbridge's neighbourhood. Professor Marti Latta will discuss discoveries from her archaeological dig in Ashbridge’s Bay seeking information about some of Toronto’s first settlers, the Ashbridges, who arrived in 1793 from Pennsylvania. 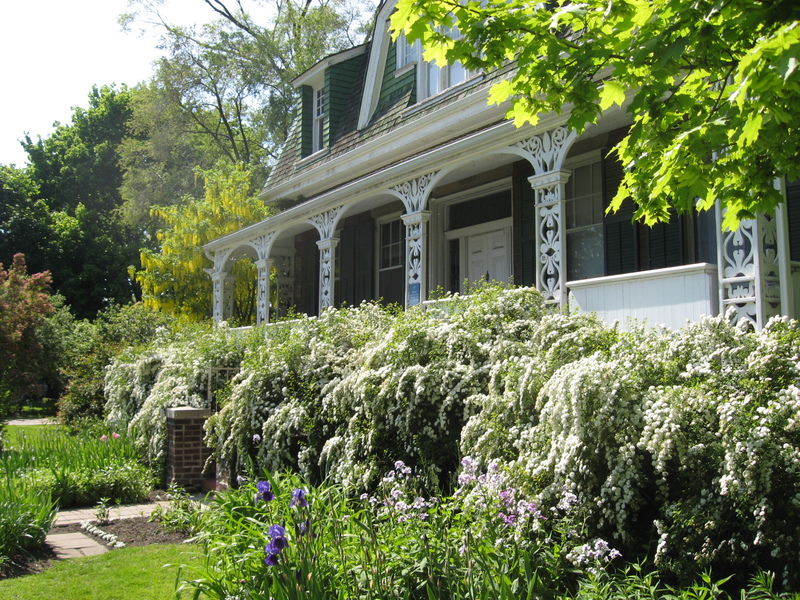 The family’s last heritage home still stands prominently on Queen St. East. Dr. Latta will describe her search for the foundations of the Ashbridge’s earliest log home and artifacts from their daily life in Upper Canada. See event details on the Riverdale Historical Society website. This entry was posted in Ashbridge Estate, Ashbridge neighbourhood history, Event on September 13, 2016 by The Ashbridge's neighbourhood.